Sometimes you can’t avoid the heat in the Disney theme parks, though. The absolute best way to stay cool and SAVE MONEY is to bring along a Klean Kanteen Insulated Reusable Water Bottle. You will not be disappointed. I’ve put Klean Kanteen to the test inside my home, putting in ice cubes and then waiting for hours to see when they’d actually melt. The results were amazing, as you can read in this blog post. A recent visit to Disney’s Animal Kingdom theme park, though, really tested out this product to the extreme. 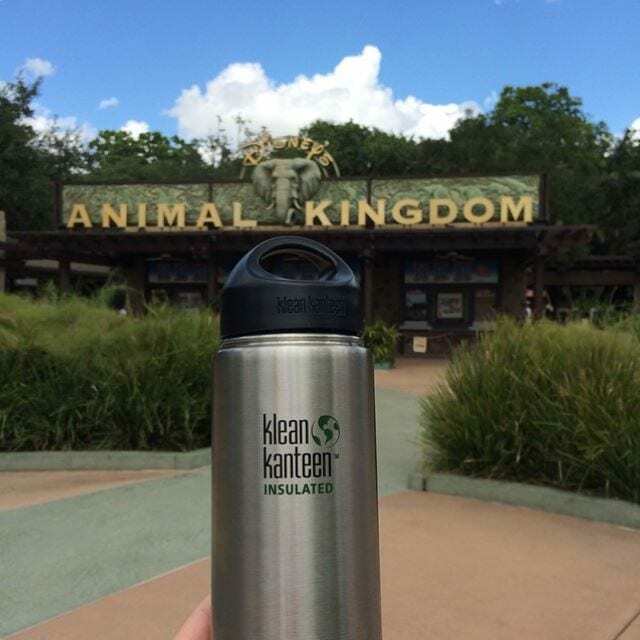 In severe heat, where the sun was baking down and the humidity was soaring, I brought my Klean Kanteen Vacuum Insulated bottle with me full of ice and water into the theme park. I was more than surprised when a couple hours later, I still had a lot of ice inside and refreshingly cold water to combat the heat. I asked for a free cup of water and ice when I purchased a snack from The Gardens Kiosk. Yes – any Walt Disney World food stand will give you a cup of water (and usually ice) if you simply ask for it – and it’s free!! I poured the water and ice into my-now-empty Klean Kanteen and continued to enjoy the theme park. A few hours later, and a stint of sitting inside my car in the hot sun, the water bottle still contained ice-cold water and chunks of ice when I finally returned home. Not only is bringing along a Klean Kanteen (or any brand!) water bottle a way to Get Green and conserve plastic usage, but it also saves you MAJOR MONEY!! A bottle of water at Disney is at least $2.50 each. If you need four bottles of water a day, it’s $10 plus tax – per person. However, even if the cost of bottled water doesn’t phase you, it’s hard to argue against the fact that the cold beverages that you buy in the middle of summer just don’t stay cold long – and then they sweat condensation. If you don’t drink down that bottle in 15-20 minutes, it’s soon warm. A Klean Kanteen Insulated bottle will keep it cold for hours, and does not sweat. The Klean Kanteen Vacuum Insulated bottles are by no means cheap – they start at $24.95 for the 12 oz. bottle and go to $29.95 for the 20 oz. bottle. However, after two to three days they would pay for themselves, in the savings from buying bottles of soda or water. Get Green: Americans use more than 50 billion plastic water bottles a year. The average American uses 167, but recycles only 38 of those, according to Ban the Bottle. Just think of how many bottles of beverage you’ll consume to stay hydrated and not pass out in the heat in just one day. Multiply that by the number of days you’re on vacation. All of a sudden, it really adds up, huh?! Be Well: Fill up with your own filtered water to avoid using bottled water which is NOT regulated for contaminants the same way that tap water is in the United States. Did you know that?? I bet not. The EPA is in charge of the water quality of tap water. The FDA is in charge of bottled water quality. Using reusable stainless steel bottles also helps you avoid drinking water that has been sitting in a plastic bottle in the heat, when it’s thought that the real leaching of chemical from plastic bottles into water occurs. « Get Green Be Well Chosen As A Top Eco-Friendly Blog!